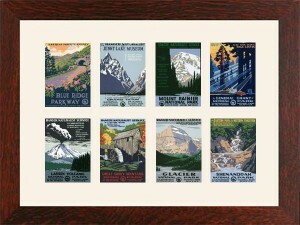 Here's a new twist on the popular WPA Note Cards designed by our friends at Ranger Doug's Enterprises- great for those of us who would love to have all the WPA posters, but have limited wall space! We've taken 8 of our favorite 4x6 notecards and mounted them in a multiple-opening archival mat, then framed them in our "Oak Park" quarter sawn white oak frame. The result is simply beautiful; and it only has a 24" x 19" overall footprint. Also- NEW FROM DARD HUNTER: Now select one of 3 color choices for our hand applied finish! All three look fantastic with this item!